under the raedar: Can Google search data predict an election victory? 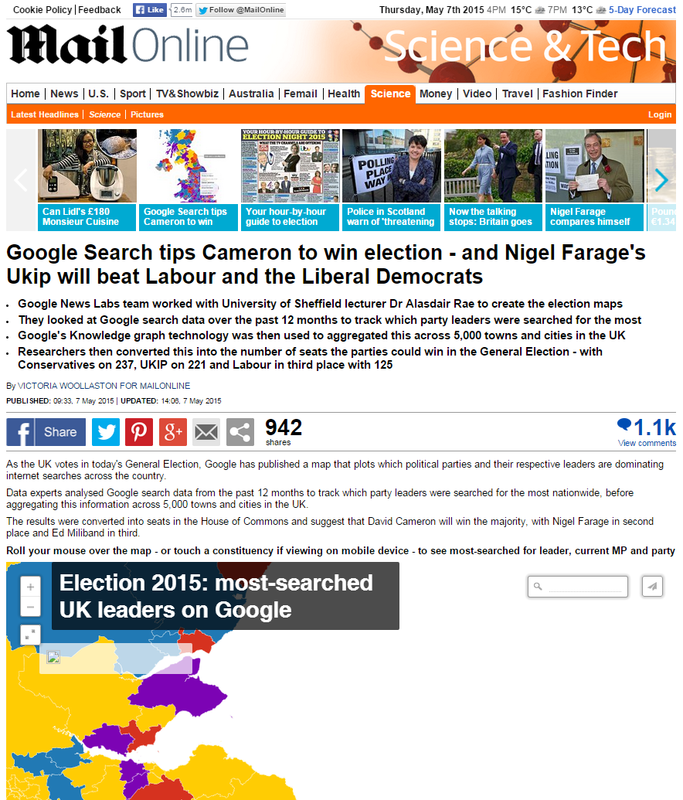 Can Google search data predict an election victory? 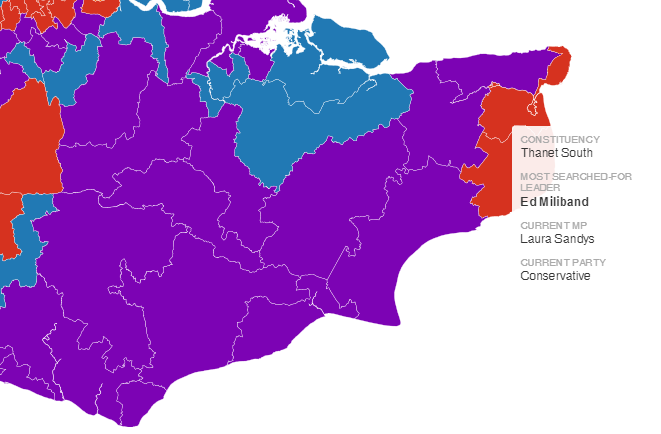 Simon Rogers, datajournalist and Data Editor at Google in San Francisco, got in touch some time in April to ask if I could help him map party leader search patterns by constituency. I'd been doing a lot of work with search data for housing markets anyway so this seemed like an interesting idea. We took search data for all points that were geocoded (there were about 5,000 total across the UK) and then produced a constituency version for all 650 seats. The final constituency results matched very closely the proportions for the individual places. The data are for the previous 12 months. The big question is what this all means. 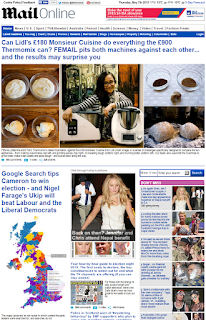 Do I think, as the MailOnline suggest, that 'Google Search tips Cameron to win election'? No. Do I think it disproves it? No. 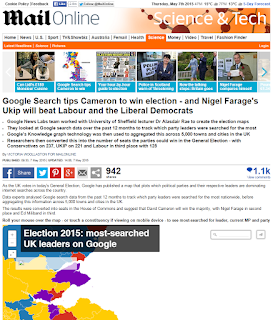 Do I think the large volume of search for Nigel Farage indicates his level of popularity across the country? Again, no. However, it could indicate that people are more likely to show interest in UKIP in an environment when nobody else is watching or listening. But we don't know. Does this prove that Miliband will come third? Definitely not. The map merely indicates who was the most searched for party leader in each constituency. The intent and sentiments of individual users are not known. In my own research in housing market analysis I've tackled this by doing interviews with website users but since this data is from Google they could of course add in other terms which people might combine with party leader names (some more favourable than others!). Kate Newton from Bing also got in touch to say they had worked on something similar (though much more sophisticated) in relation to the Scottish Independence referendum last year. More widely, there is a body of emerging research (including my own) which looks at search patterns and subsequent activity - mostly in the field of economics. The results suggest that search can be analysed meaningfully to predict future activity. But that's not what the party leader piece was about - not from my perspective. Thankfully, other media outlets were more measured in their analysis - such as BuzzFeed UK, The Scotsman, and The Telegraph. 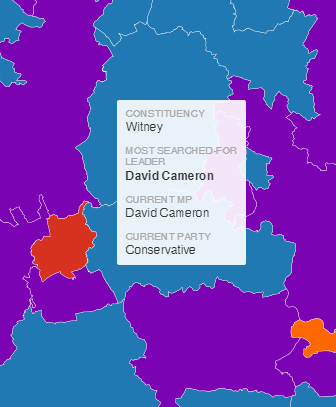 David Cameron is the most searched for leader in his own constituency, but he's surrounded by a sea of purple, plus a blob of red and orange. Perhaps a little predictably, there is a lot of search for UKIP in Kent but - strangely - it appears that in the constituency where Nigel Farage is standing (Thanet South) the party leader most searched for is Ed Miliband. The search results produce some interesting results. The image below is a good example. 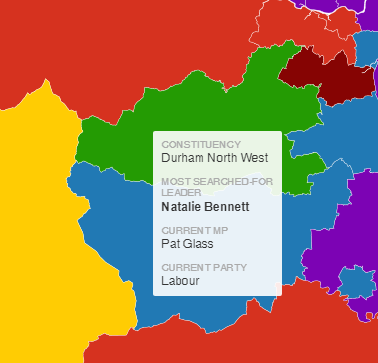 Natalie Bennett (Green Party) is the most searched for leader in Durham North West and next door in Durham North the leader (by search over the past 12 months) is Leanne Wood (Plaid Cymru). I suspect this was down to a localised spike in interest after the leaders' debates. Durham - Green and Welsh Nationalist stronghold? Other interesting nuggets to emerge were the way in which geographical patterns sometimes reflected the opposite of what you'd expect. The most obvious example was where Nicola Sturgeon (SNP and not standing in this election) was the most searched for party leader in several English constituencies, such as Chesterfield (below). Her excellent performance in the leaders' debates probably led to a spike in interest. Perhaps the SNP ought to consider putting up candidates in England too. The SNP take Chesterfield? Not so fast. 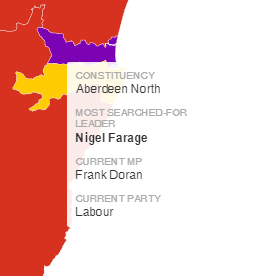 A kind of similar situation to the SNP/Chesterfield example can be seen in the final image below, where Nigel Farage is the most searched for leader in Aberdeen North. This Scottish constituency has no UKIP candidate and, even if it did, they would be a long way away from the top party. What's my prediction for the outcome of the election? The only prediction I'll make is that the results will look nothing like this map!